Sorry, Arcade Fire: party’s over. 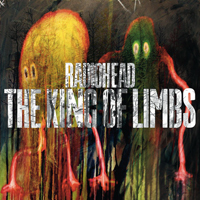 Radiohead will take its shot at the 2012 Album of the Year Grammy with The King of Limbs, the best band in the world’s eighth studio album and first since 2007’s game-changing In Rainbows. Like its predecessor, the new disc will arrive a week after today’s announcement, in “two versions – digital download (either MP3 or WAV) and a special, made to order deluxe edition featuring 2 clear 10″ vinyl records, a CD, a digital download and exclusive artwork all in a special ‘newspaper’ format” starting this Saturday. A standard retail edition will follow on March 28. Credit to the band for selling a digital edition in 320kpbs rather than 160 (for shame!) this time around. No word on the tracklist, which could potentially include 2009 one-offs “Harry Patch” or “These Are My Twisted Words,” or the new songs (“Give Up the Ghost”) that frontman Thom Yorke’s been playing with Atoms for Peace. The band spent significant time in L.A. recording the album, which was produced as usual by Nigel Godrich. So: awesome. Now we’re just waiting for somebody to apologize for Wall of Ice. Here’s the pre-order link.